Bet partitions the Unity and Wholeness of ALePh. ALePh by itself is One. There is no opposition or polarity and no need for action or change. BeT is distinction ( – B) pointing ( – I) in itself ( – T). BeT partitions ALePh. BeT, as the first possible distinction, distinguishes what is within from what is without. From BeT on there is difference, complement, counterpoint, and contrast. There is spirit and matter, flame and coal, wave and particle. BeT is a BIT, it takes a BYTe, it parts ALePh in two (Tween). BeT forms a BooTh BeTween BoTh. That is why BeT, two and duality, is a House. As a prefix BeT means In or With. BeT is the Yin/Yang Bifurcation within the Primal Point, the Dew-drop of Manna BREAKING OUT from the tip of the Great Flame. BeT is the Primal Point, the APPLe seed, Breaking open. BET is the second letter of the Hebrew alphabet (corresponding to the Greek "Beta", the Arabic "Ba", and our English "B"), and the first letter of the Hebrew text of Genesis. The meaning of the name of the letter, "Bet" in Hebrew, is "House" – and what a house does and represents. Thus, Bet represents the distinction between inside and outside. This is the same distinction that generates the alphabet from our model: the First Hand vortex inside, representing a flame, with a tetrahedral "meeting tent" outside, representing the vessel that holds and protects the flame. 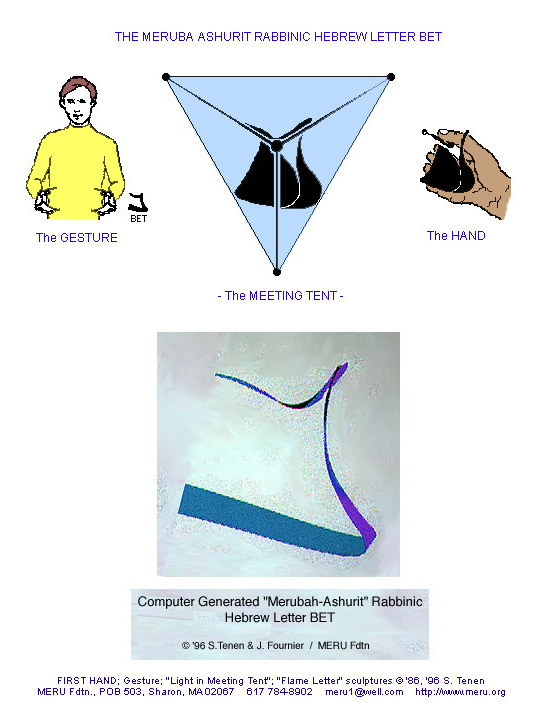 Our paper, The Light in the Meeting Tent, explains how this inside/outside relationship is also the relationship of asymmetry and symmetry, of mind and body, of our private conscious inner world, and the objective outer world we share. There is a traditional teaching that all of the Torah is contained in the first letter. What is in the first letter is also in the first word, and in the first verse, and in the first paragraph, and in the first chapter. In modern terms, this teaching is telling us that the Torah is a hierarchical structure, somewhat (although imprecisely) like a hologram. The image is always the same; a larger hologram provides a sharper image. So, in principle, if we understand the first letter, that should tell us a great deal about what follows. Mathematician G. Spencer Brown, in his Laws of Form, explains how the "First Distinction," the distinction between inside and outside, can in itself, in principle, generate whole worlds. Mathematicians have shown that all of formal logic can be derived from the distinction between inside and outside. In the Talmud, a person of integrity is said to be toko k-varo, "their insides are the same as their outsides" – they are morally transparent. A person whose consciousness is in harmony with their place in the outer world is a Tzaddik, a saintly person. This is because, with no distinction between inside and outside, there is no motive for their personal will. Such a person would, in a sense, be without willful ego. It is possible that this is why Moses receives the Torah. Seemingly paradoxically, in spite of his confrontations with Pharoah, and his leadership of the nation, in the Talmud Moses is known as the humblest of persons. Thus, a person who truly comprehends the meaning of the initial letter of the Torah has the humility, the "righteousness," that qualifies them to receive and carry it.